My name is Robert (name changed) and I work in Australia. At our practice we use your inversion devices, however we have started to increase the amount of inversion correction we use, and as such seem to be getting an issue with the medial fat pad at the heel where the devices are coming out with less correction than the required platform degree. Also must state we use weight bearing box impression rather than POP. My question is when modifying at the plaster stage, do you have a method of measuring or checking the ratio of platform to heel position. Obviously if the heel is not modified correctly the ratio is not accurate or will vary. Many thanks in advance, we look forward to seeing if you have an answer. Here are some photos of the area we are discussing. The medial heel area is off the ground with this 25 degree positioning. This will create the inverted cant that predictably gets 5 degrees of pronation correction. This is the same posterior photo of a 25 degree correction. In normal suspension casting, the heel is very round, so as you invert the heel in your correction you sometimes lose some of the varus cant required for pronation control. But, with the weight bearing box casting, the difference in heel shape will change the correction per degree ratio. This is another left foot flatter on the bottom of the heel, but also set at 25 degrees inverted. If you compare this 2nd left foot to the first photo, you can tell the subtle increase in pronation support just be the flatter heel. A goniometer is always used to check the inversion cant. So, with the classic teaching of the Inverted Technique, if you set the heel at 25 degrees Inverted, you would get 5 degrees of actual pronation control. A patient standing at 5 degrees everted of heel valgus would predictably stand vertical. Your question shows that cast technique will change this. You must evaluate if 25 degrees of inversion with box casting in general gives you 5 degrees of foot pronation control. You mention the medial fat pad and how that definitely, and negatively, influences this. However, what neutralizes that are 2 important factors. The first is that the box technique tends to create a flatter heel. The flatter the heel, the more varus cant you actually get when you do invert it. The rounder the heel, as you invert, sometimes you just rotate the rounded heel and do not get much inversion at the heel. You will always get more talo-navicular and naviculo-first cuneiform support with more inversion. It is with more rounded heels that I need more Kirby skives to help get the correction I need. Second of all, the amount of forefoot varus or forefoot valgus makes a big difference. And, I believe you get more forefoot varus angulation in a box cast versus a suspension cast, but I have not seen this written. Take 2 feet, one with 15 degrees of forefoot varus, and the other with 15 degrees of forefoot valgus. If you ask the lab to make 25 degrees of inverted correction in both, which one will have more support. Which positive cast, after it has been poured, has to be corrected further. The 15 degree forefoot varus foot cast will sit 15 degrees everted at rest and you have to correct 40 degrees to get the heel 25 degrees inverted. The 15 degree forefoot valgus foot cast will sit 15 degrees inverted and will have to be corrected only 10 degrees to get the desired 25 degree inversion. This subtlety can also make a big difference. You definitely get more correction of the medial column with a 25 degree inverted correction in a forefoot varus foot than a forefoot valgus foot. After a cortisone shot, how long does it take for the cortisone to reduce the inflammation/pain from the nerve? I was given a mixture of short term and long term cortisone. I was told 2cc's (Kenalog Ten 1/2 cc & Dexamethiasone 1/2cc and 1cc of Litocane). Paul, thanks for the email. I am attaching a link that talks about cortisone shots. I am not sure how much the short acting works (not a big fan), but the long acting takes 3 to 7 days to begin to work. It can take up to 2 weeks for you to access the overall effectiveness. Thank you for the response. I did go back and read your blog information as it relates to cortisone shots. I assume then that the Lidocane 1cc was the short term and the Kengalog Ten and Dexa was the long term? With 1/2cc of each of the long term, how many mg's does that equal? Was my cortisone shot moderate in its dosage or more on the weaker & less potent side? Thank you again. I wish your office was closer so that I can go and see you. I am located in the Phoenix, AZ area. I'm only 39 years old and my foot nueroma has left me in great pain. What do you think my next plan should be? Since I received the weak cortisone shot 3 days ago and still no real relief. Should I try and find another podiatrist or ask this current one to increase the dosage of long acting coritsone? How soon can I go back for a cortisone shot without risking complications due to scar tissue/over-injection of a site? Dr Blake's comment: Do not consider the first shot weak, it is just his/her standard. Injections for Morton's Neuromas can be very irritative so health care providers have their standard injections that they feel comfortable with. You have to wait 2 weeks for another shot, by then you hopefully are feeling better from the initial 5 mg. I always give patients one shot at a time, knowing I can give up to 30 mg if needed. Most do not need that much. Hopefully, you won't. Remember that long acting cortisone lasts for 9 months. Sorry I implied that a 5 mg shot was weak. I should have emphasized how conservative and caring that doctor probably was being to help you. My bad!!!!!!! I wonder what the reasoning is when podiatrists give such weak shots? At $100 per shot (ultra-sound guided), I would rather pay for the better shot upfront than keep going back numerous times for a shot that doesn't really help much. My name is Lisa, I'm Spanish and I study my 2º year in Podiatry. You may have some articles to send me, so I can do work on their inverted orthoses and results in children, for my subjet 'Child Podiatry'? I need it, and it's very dificult to find this on internet! Hey Lisa, Thanks for your interest in my pride and joy "The Inverted Orthotic Technique". This post will be our conversation about the technique and it's use with children with severe flat feet. I invented the technique now over 30 years and I always appreciate someone interested in the technique. Over the last 10 years I have refined techniques and Rx modifications due to many great theories and studies and patient outcomes. I will put every email on this one post, that will build on itself. Every 2 or 3 days, as time allows I will either answer questions you pose or begin to discuss how I use the Inverted Technique in 2013 for my patients. I will start our conversation with attaching the links already in this blog on the Inverted Orthotic Technique. Each one of these links has some valuable nuisances related to the Inverted Technique. PS. Good luck in your career!! I am orthopaedic nurse and also a marathoner. I've been dealing with posterior tibial tendonitis now for going on 4 years...it has never really been 100%, but has times of intermittent improvement. I have a flexible flat foot and I wear custom orthotics. Anyway, I just completed a trail marathon yesterday and it flared out of no where in the first mile...it had been doing just ok and now it's swollen again and pretty painful to walk. Dr Blake's comment: You do know that you should have pulled out of that marathon?? I am to call my doc whenever I want to proceed with an MRI (we talked about this months ago) since I've had it for so long. I've tried obviously the orthotics + stability shoes, PTT bracing (which does help-but I've worn it so long I was getting peroneal nerve irritation! ), physical therapy and I've been on diclofenac BID for almost a year now and have even tried a medrol dose pack. I've also of course taken rest time from running and didn't run for almost 2 months...did only pool running and it just came back again when I started running. Dr Blake's comment: For the bracing, try placing some padding between the skin and the brace to protect yourself. Also, if you are going to be on any anti-inflammatory drugs, like diclofenac, for a long time, always pulse it (like 10 days on, 4 days off, or 5 on 2 off) to give your body a rest from the toxicity. I'm going to get the MRI to see what the tendon health is like...but we've talked about debridement before and was wondering you thoughts on that. I am nervous that it will just give me lots more downtime and then it will just come back again. I'm not sure what to do at this point and was looking for some good advice! Thanks for the email. I am glad you could run a marathon, especially on trails, with your injury. Normally means you have a first degree tendon injury, not a partial tear (2nd degree). The second degree and third degree need surgery so much more frequent than first degree. First of all, if you felt pain at the first mile and continued to run another 25.2 miles, then you deserve this flareup. That breaks so many rules of injury rehabilitation. Since I am now recovering from my own stupidity, which made my back so much worse, I will not cast the first stone however. I do know how frustrating it can be when you have had this for 4 years!!! The posterior tibial tendon unfortunately plantar flexes the ankle along with stabilizing the subtalar joint. It is the subtalar joint that is protected with orthotics and stable shoes. The posterior tibial tendon still can get irritated when it assists the achilles tendon in pushing you off the ground. No brace, orthotic, or shoe can help that. So, if you have posterior tibial tendon problems, and if you want to run, you have to be on a great posterior tibial strengthening program. You did not mention these in your email, and they are vital to be able to run along with the shoes, braces, and orthotic devices. The following link may help you with your rehabilitation. Strengthen a tendon from the minute you hurt it. But, it can not hurt while you are strengthening. Does your orthotics stabilize you well? That could be an area to improve. So many different designs on orthotics. You want to feel that it supports you well and your weight is very centered through your feet. Make sure you combine stable orthotics with stable shoes that are power laced. Make sure, even though you are frustrated with your injury, that you do not function with pain (this can only make things worse). What do I know about debridement? Tendon surgery is very successful in general, but the surgeon and team of physical therapists must understand tendon physiology and function. This is vital in the days after tendon surgery with the initial advice given to you by the surgeon. Achilles tendon rehabilitation is the same and yet different than posterior tibial tendon surgery. Both tendons, yet very different functions. Where debridement goes wrong, is typically in the understanding of its rehabilitation. Before surgery on the posterior tibial tendon, the patient must have great orthotics, not just orthotics, understand the subtleties of posterior tibial strengthening, not just have a theraband in the house, know how to differentiate when to ice and when to heat, not just read a handout on icing, and select a physical therapist knowledgeable of this surgery so that after surgery when the time comes, physical therapy can be started. Thank you so much for taking time out of your busy day to choose to answer my email question, I really do appreciate it. My ankle is improving and I'm not having much pain now at all walking just wearing my stability shoes with new orthotics. I definitely knew what I was in for when I continued to run, but marathoners do tend to be a stubborn bunch! :) My MRI actually showed PTT tendonosis/tenosynotivits as well as some other minor tendonitis and a small partial tear of my achilles. So we are thinking now that it's possible that some of the pain was radiating from my achilles injury as well. Throughout my training I would have some tweaks here and there posteriorly, but didn't think much of it...but now it makes sense that it was both the PTT and achilles contributing and why my orthotic adjustments didn't totally fix the problem. I understand very well that these are also overuse/wear and tear injuries from training and that I need to rest. I haven't run in 2 weeks (for my ankle as well as a chronic knee injury in the opposite leg that is flared). I'm icing both areas multiple times a day. I have actually tried PT for my ankle PTT, but it seemed like all the exercises that I did just made it worse...then I would wait until it was pretty much pain free and try again with less reps and resistance and again it would cause another flare up...so I'm really not sure what to do there. I questioned my podiatrist about this and he said that it is not a strength issue with me, but instead structural and orthotics were the main solution...so he says PT won't really help me much (which I can't say I agree). I would still definitely like to continue to at least try some different PT exercises and will watch your video. Thank you so very much once again for your time. I'm still not sure what you mean by power lacing though...I tried to look it up online and all I could find is for high-top style shoes. Dr Blake's comment: Definitely you need a skilled PT to be able to help you learn how to strengthen the Posterior Tibial Tendon. The MRI shows you do not have an injury that you should not be able to strengthen the tendon. Below is my link on power lacing. Many of my elderly patients are unsteady. This article documents the possible benefits of foot orthotic devices as an important aspect of a Fall Prevention Program. Functional Foot Orthotic Devices can dramatically improve the surface area of contact of the bottom of the foot (bringing the ground up to meet the foot surface exactly) enhancing proprioception or balance. I have seen this daily in my private practice. But, it must be used with stable shoes, and the patient must look more stable and feel more stable. Sometimes, it appears more stable to me, but the patient senses some instability. Sometimes, the patient feels fine, but the shoe/orthotic combination looks unstable to me. So, functional foot orthotics must be evaluated shoe by shoe in a good Fall Prevention Program, but will be a valuable part of this program. Just a quick update on my LEFT foot tibial sesamoid fracture. So I got my recent flare-up in January and after your advice, I put myself back the boot to create a pain-free environment and all went well and I was back to 1-2 level pain (good pain hopefully) within 10 days. Thank you! Hopefully no more of those! The bone has healed with part bone and part fibrous union, so it still appears mostly partially union with a slight bridge of bone on an x-ray. But pain is manageable (0-2) at this stage in a stiff soled shoe. Though I was hoping you could help me out with one more thing.... my RIGHT foot. Clearly my right foot has taken the brunt of the weight during my recovery of the left foot. During my 3 months in the boot, I did experience slight sesamoid pain here and there in the right foot (which I had never felt before.... no foot problems whole life). That clearly concerned me during at that time (6 weeks into the left foot sesamoid injury). My podiatrist concluded that there was no fracture on the right foot given her examination (palpitation) and x-rays. When I got out of the boot (on the left) after 3 months, the pain on the right subsided and I felt zero pain on the right. Anyway, 5 weeks ago, I started getting the pain back in my RIGHT foot and it was a little more prominent than it had been before but not even close to what my fractured sesamoid on the left felt like in the beginning of that injury. It has not gotten worse or better in the last 5 weeks and the pain is probably at a 3-4. Dr Blake's comment: Definitely we need to do something with the pain level above 2. Normally, I would just have you starting 10 minute ice pack on the area 3 times daily to see how that goes for 2 weeks. When putting weight on it, it tingles more so than hurts, which is totally different from when the left was initially injured which was straight 8-9 pain. Still, I was worried and got x-rays with my podiatrist again with negative results for a fracture. Dr Blake's comment: Tingling is nerve pain. Removable casts, even with EvenUps, can torque the back and cause referred pain to the foot. L4/5 nerve compression at the back can cause referred pain right to the sesamoid area. Lucky us!!! The nerve pain can also come from swelling near/around the sesamoid pressing on the nerves internally (not from the back). The icing should help that. I went for a 2nd opinion to the foot orthopedic surgeon I had seen off and on with my left foot. He saw nothing on the x-ray and ordered an MRI. Last week, I got the MRI and the radiologist concluded that I had sesamoiditis in the right foot, though "no fracture". My foot orthopedic surgeon does not agree with the findings and thinks I have a fracture. He is basing this on a to some discoloration (darkness) in the tibial sesamoid on the MRI and also a possible line on another MRI image. Dr Blake's comment: A fracture of the right sesamoid would be rare if you do not have a bone density issue (how is your Vit D and Calcium intakes?) However, a stress reaction to the sesamoid, without a break, is possible from favoring, and would cause swelling in the sesamoid bone. This is worse than sesamoiditis, but not as bad as a sesamoid fracture. Treatment is to ice, contrasts, protect the bone, and perhaps PT or accupuncture to flush the swollen bone. But, PT is the trickiest, and you would want to be very certain of that diagnosis. He said it might even be AVN (which I know is probably the worst thing ever). Dr Blake's comment: AVN means avascular necrosis or dead bone. What are the odds, since we are always playing with reasonable odds, or educated guesses, that you have a dead bone from limping? Not high odds. In the MRI world, sesamoid AVN and peroneal tears are the 2 big calls that normally are not there. So, for right now I would take those odds. My podiatrist says that based on the fact that I have very little pain from palpitation, and given the radiologist conclusions, that I do not have a fracture. Clearly I like that conclusion better, but she admits that she is not an expert in reading MRI's. She also scared me a little with saying that if there is indeed no fracture, that she could do a cortizone shot to help the sesamoiditis inflammation. After everything you have written, I know that's not the best thing to do given the uncertainty of the bone right now. Dr Blake's comment: Definitely long acting cortisone would potentially be bad, but short acting cortisone, like 8 days of oral cortisone in a tapering dose, may be very very helpful. The long acting just masks pain for too long and you can really hurt yourself without knowing over the next 9 months. Find out what type of cortisone, and also discuss oral cortisone. I do have a lot of trust in this well-respected orthopedic surgeon, though it's hard to emotionally face his prognosis (especially as I'm still recovering on the left foot sesamoid injury 5 months out with a stiff soled shoe). Given his fracture diagnosis, he said he recommend getting into the boot for 2 months and if it still hurts after that, doing surgery to shave down the sesamoid (he believes it is fractured). Dr Blake's comment: Well meaning, but too aggressive for me. I have worn the boot for one week, though it is putting further pressure on my not fully healed left foot sesamoid. Also, I am having lower back pain despite using an Even Up; as I think I'm still very much trying to protect the left foot still. At this point, I am switching between boot and stiff soled shoe. Icing 2 times daily, and using the Exogen bone stimulator on both the left, and now the right side. Anyway, it's been quite the ride and I'm sort of at a loss of what to do (two broken sesamoids!) and was wondering if you could PLEASE offer your opinion to me again. 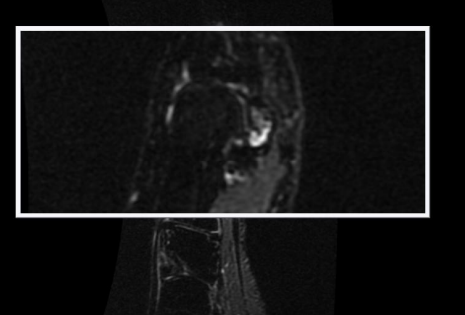 I know this would a lot easier if you had the disk (which I can send), but I have attached the three MRI images the summary from the MRI. Any of your opinions would be great. If not could you recommend anyone for a 4th opinion in Chicago? 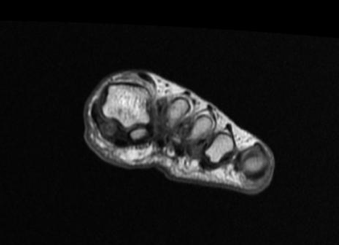 Inflammation surrounding the medial sesamoid. Fluid surrounding the medial sesamoid best identified on the coronal T2 IR image #20 series 5 and axial T2 IR image 5. Series 7. Minimal reactive edema within the medial sesamoid without fracture. Degenerative changes at the medial articulating surface of the first metatarsal with marginal osteophytes. Lateral sesamoid and articulation with the first metatarsal head unremarkable. Marginal osteophytes also present at the first metatarsal head dorsally laterally. Minimal Hallux valgus with 10% first metatarsal head joint exposure. 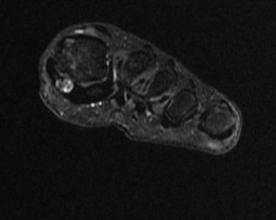 Minimal edema within the plantar fat pad beneath the medial sesamoid identified on sagittal IR are image 4 series 3. No other significant findings. 1. Inflammation at the medial sesamoid without evidence of fracture. Edema surrounds the medial sesamoid and extends into the plantar fat pad. 2. Maginal osteophytes at the first metatarsal head including at the articulation of the medial sesamoid. Largest marginal osteophytes and laterally. Dr Blake's comment: Now this makes sense. What is the easiest explanation for this problem? 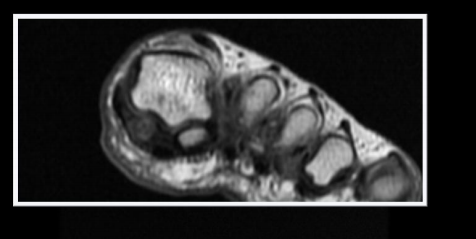 The easiest explanation is that the right big toe joint has some arthritis (wear and tear) that got all stressed out and inflamed with the overload due to the months of favoring the left sesamoid injury. The treatment for the right big toe joint can be spica taping, icing, contrasts, dancer's padding, arch support, stiff shoes, removable boot in some reasonable order to calm down. Physical therapy and acupuncture can also help. Short acting cortisone shot or oral cortisone burst can help also. Perhaps a low back evaluation with treatment ideas and see if they think some of the foot pain is coming from the back. It is called "double crush" syndrome where the nerve is irritated at both the foot and back and this causes the pain/abnormal sensations to be worse. Can't stress enough how helpful I've found your blog over the past few months. Thanks so much for taking the time to respond to people and share the exchanges on here. I've learned so much about sesamoids and have many of your blog posts to thank for that! I suspect I fractured my right tibial sesamoid during a cross country running race on November 24. It was at the very end of the race and I felt a definite crack, but the physiotherapist at the finish line assured me that my foot wasn't broken. (I think it might be salient to mention that I'm almost exclusively a forefoot striker and that this race was a couple kilometres longer than the 5ks I'm used to doing.) I limped around that night, but by the next morning, the whole foot was throbbing and I couldn't put any weight on it. Went to the emergency room and got an x-ray. The doctor said the sesamoid was likely broken, but that "it wasn't serious" and should heal in 6-8 weeks. They sent me out with crutches. Receiving this diagnosis, I saw no need to go to another doctor, so I iced and pool ran patiently for 8 weeks. After the first week in the crutches, it started snowing a lot (I'm from Montreal) so the crutches became quite dangerous outside. Since the initial trauma, my foot had calmed down a LOT by week 2. It only hurt when I put all my weight on it and I could walk almost normally by placing a bit more weight on the sides of my feet, so I did that and shuffled to and from school. Because there was so much early progress, I assumed it was okay to wean myself off the crutches like this. My assistant coach is a podiatrist so he made me a dancer's pad to put in my running shoe. It didn't help a whole lot. In hindsight, I should have asked for a medical boot ASAP. As 8 weeks turned into 12 and 14, etc, I began to get frustrated over why the bone wasn't fully healing. On February 22 I got another x-ray which came back saying, "no sesamoid fracture." I asked my doctor for a medical boot anyway. (Neither this doctor nor the one in the emergency room had suggested it, but I insisted). I've now been in the boot for a couple weeks. Dr Blake's comment: There is nothing totally magical about the boot. You have to create a pain free environment, and it sounds like you were. So as of Feb 24th, you should be at 3 months into healing. It's now been over 3 months since the fracture occurred, but I've had little to no observable improvement since week 2. Got an MRI tonight, but will have to wait 2-3 weeks for the report to reach my sports doctor. I asked for a CD of the images so I could look at them myself and compare them to those online and in medical journals. 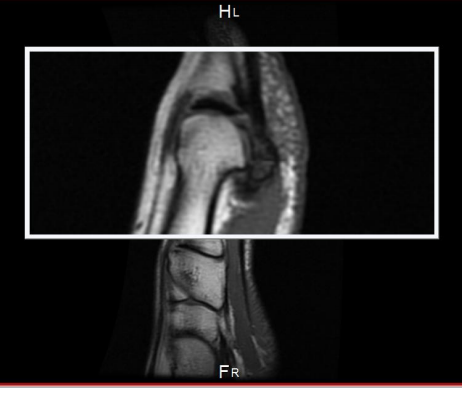 Reading your posts about other injured sesamoids on MRIs, I can see that its lighting up on the T2 images could be a sign that is has a stress fracture. It shines pretty brightly! Dr Blake's comment: Remember the MRI is now our baseline of treatment. 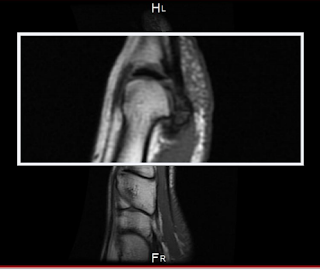 If the MRI is positive for bone edema (bright T2 images), we have to wait a minimum of 3 months before we can get another one to check on progress. X rays are poor indicators on healing, as is palpable soreness. My questions: How can I tell if my sesamoid has an acute fracture or stress fracture? Because the injury happened so suddenly, I thought for sure that it was an acute fracture, but since nothing showed up on the x-ray and because I have put repeated stress on the bone for 9 years of distance running (I am 22), it could very well be the latter. Dr Blake's comment: First of all, the fact that the xray does not show a fracture line means that it is definitely not a displaced fracture (hard to miss), and has the opportunity to completely heal. A stress fracture sometimes can not be seen, and therefore misdiagnosed as sesamoiditis (non serious inflammation of the sesamoid with no break) all the time. By your history, you had an acute break, and the MRI now documents the bone edema consistent with that. We can leave the xrays out of the equation now, since they ruled out a displaced fracture, and you now have a baseline MRI. I may have made some early mistakes with abandoning my crutches too soon and not getting the boot soon enough, but for the majority of this 3 month period, I haven't been causing pain to my foot. It simply hurts to put all my weight on the area by leaning inwards, and certainly to run on it (though I haven't tried). Given my situation, when might I realistically hope to be running again? Dr Blake's comment: You were creating a healing environment, so you should have no guilt there!!! However, I would be overly cautious with sesamoid injuries, and spend the next 2 months in the boot. It will take 4-6 weeks to then wean out of the boot. 6-8 weeks weeks should be then spent biking, walking, swimming, elliptical to regain your core. Then you are ready for a walk run program, if all goes well. You are putting yourself in the Immobilization/Anti-inflammatory Phase of Rehabilitation by going into the boot to be extra cautious, and I think that is good. The immobilization part is the boot, but you can find Hike and Bike Shoes or Hiking boots, or even the New Balance 928 to try and see if you get the same immobilization with these (the same pain relief). The anti-inflammatory part is 2 times a day 10 minute ice pack and 1 twenty minute contrast bath (see my blog). During this time you need to have some insert made that protects the sesamoid for your future runnning. The insert will typically have some arch support to put your weight in the center of your foot at push off, and some form of dancer's pad and maybe even a metatarsal pad. That can take the whole 2 months to get accomplished. 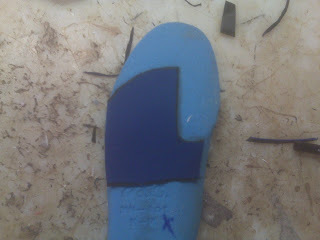 You can also learn spica taping (see my blog) and purchase a carbon graphite plate for the shoes post cast. Is there a reason why some sesamoid fractures take 8 weeks to heal, but others seemingly take over a year? I've been given foot strengthening exercises to do by a physio. Should I be doing these at this point? Dr Blake's comment: Theoretically, The Immobilization Phase and The Restrengthening Phase are separate entities, but if you can develop strengthening exercises that do not hurt, you should be starting the minute you hurt your foot. So, keep them painfree, but continue to strengthen for the next year. Challenge yourself with more and more sets, reps, or difficulty. Because my school has a reading week, I have the opportunity to spend up to 8 days without walking AT ALL. Do you think this might speed things along? Dr Blake's comment: It is pain free activity that heals due to the good stresses it places on tissues, not pain free inactivity. But, a balance is okay also. And lastly, is there anything else I should be doing to ensure I'm creating the right environment for my sesamoid to heal? I don't have access to a bone growth stimulator, but I could start icing again, if that might help. Dr Blake's comment: Yes, good diet, some sun exposure for Vitamin D, pain free foot and ankle strengthening, inserts that protect, learn spica taping, check out shoes that limit motion (listed above), icing twice daily, contrast bathing each evening, work on core exercises, and some cardio with biking (best to place pedal in arch if normal stationary bike). I'm attaching some MRI images for reference. Let me know if you can't open them! Fracture (non displaced) is seen easily in the darkened bone. Here is a T1 MRI image where normal bone is light colored. 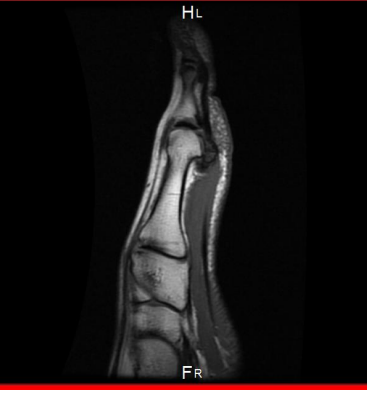 This T2 image shows a brighter bone with swelling nearby. In T2 images healthy bones on black, and fluid is highlighted whiter or brighter. This T1 image shows that the injury is to the medial or tibial sesamoid only. 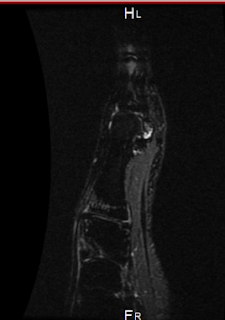 This T2 Image shows the bone edema in the tibial sesamoid that we need to flush out with icing and contrast bathing. Comparing this to another MRI in 3 plus months will really tell you if you are on the way to great healing. I practice in an area where many of the top surgeons prefer fusing an arthritic big toe joint called Hallux Rigidus. But, there are options out there that I hope these 2 links give you some reference point. I am not a surgeon, but in the hundreds and hundreds of Hallux Rigidus cases I have seen, most patients are avoiding surgery. Those who need surgery have to look for a recommended 3 surgeons to honestly discuss cheilectomy (joint clean out), shortening osteotomy of the first metatarsal, joint replacement, intra-positional arthroplasty, and joint fusion (arthrodesis). There are definite camps of preferences. You need a surgeon who is skilled in all of these and knows the subtle differences and where your joint fits into this schema. You don't want to hear "I always do it this way". I do try to live in that ideal world. Fantasy??? reading your blog you know your stuff. because I assumed the shoes caused the pain, I got the same pain back. appropriate email with so many questions. Thank you for the great email. You need to look at this 2 weeks at a time. What is the 2 week goal we should set? Since you love your tennis, only back to hitting and practicing only. You ice after for 30 minutes then another icing later that night. You go every other day, and give yourself 48 hours of recovery. You pain can not go over level 2-3 out of 10, and you want to be able to be the same by the next day. You stop playing/practicing as soon as the pain increases while playing. You should be playing with spica taping, orthotics, and some version of dancer's pads with the orthotics. This 2 week goal introduces tennis, tries to control the stresses through the sesamoids, tires not to have pain increase, but does not necessary try to eliminate all pain. If you have a high pain threshold, you may need to be more controlling. Try to really listen to your Body. This method does not ignore pain, just accepts some level is okay. Good Pain. Dr. Blake, I was recently diagnosed by an orthopedist with Hallux Rigidus. He took X-rays, pronounced I had it, gave me Mobic, said I could never wear flip flops, high heels or even the flats I had on and waved goodbye. (Mobic made me feel dizzy and nauseated, so that was out). Dr Blake's comment: Mobic, generic is meloxicam, is one of the non steriodal anti-inflammatories. There are 9 classes of these drugs, and several may be ideal for you. If this is an option, you need your internist to begin to experiment and find one that really helps. I like the 10 day on and 4 day off rotation. This allows you to detoxify from the drug and the 4 days off should be ample time to decide if the drug is helping you. If not, or unsure, switch to another class of drug for another 10/4 rotation. Thankfully, I found your website. I was going to buy a Budin Splint, but they don't make them to go over the problem joint/toe which is the big toe? I'm confused. Dr Blake's comment: For the big toe joint, spica taping works like a budin splint for the lesser toes. I am trying to run/walk, but realize I am no longer walking normal. I am walking on the side of my foot and know this is going to be big trouble- soon. Dr Blake's comment: Limping or favoring the injured area is potentially very damaging and can cause worse problems in your knees and hips. Probably okay when you stand to roll to the outside, but not when you walk and run. You need an insert/dancer's padding that enables you to off weight the sore area without limping. My toe joint feels like it is on fire at the end of the day. Putting weight on it isn't the problem, but if that joint bends, it honestly feels like it is going to break and hurts like the devil. I just began icing it recently. I have been very careful to buy shoes that exert little to no pressure on this toe joint for years. Dr Blake's comment: For the next month, ice pack the bottom of the joint for 15 minutes twice daily and do one end of the day contrasts to flush the joint of fluid. This typically works better than medications, although once you are doing your topical treatments, the meds may be a good choice to add. Exercise has proved daunting and the resulting weight gain has done nothing to ease the pain, as you can imagine. Dr Blake's comment: Stationary Biking has been a great exercise, since you can put the pedal in your arch. Swimming is also great without pushing off the wall with your bad foot. If you can design a good dancer's pad, even elliptical can be used as long as the weight is on the lesser metatarsals and you do not use your arms. It is so crucial you keep your quads/core strong to help support your frame off the foot. Weaker core, more collapse of the foot and more pressure on the big toe joint. Even Pilates and Yoga mat exercises at home with a DVD can prove very important. I have Voltaren gel, but just used it a couple of times and noticed no difference. Dr Blake's comment: Voltaren gel, or Flector patches can be used on the top of the joint 24/7 since it does not interfere with the Spica taping. You must use for 1 month 3 times a day before you really see the benefit, or decide to not use. I take aspirin regularly, but dont take Ibuprofen because it raises my blood pressure a lot. I have Aleve, but don't use it much cause I'm afraid of its effects on BP. 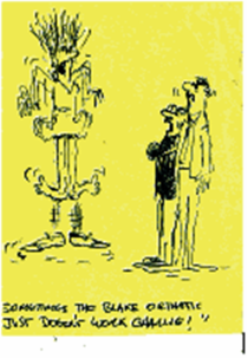 Dr Blake's comment: I really do not like any of them, unless it is just to help control flares. I would rather you ice and contrast bath. You can ice 10 minutes hourly (when you are home) for a 2 week period to see how that works. It is 100% anti-inflammatory without GI or cardio-vascular side-effects. Would you advise that I see a podiatrist to get orthotics? I don't intend to have surgery in the near future, so I'll do just about anything else. Dr Blake's comments: Yes, orthotics that take the pressure off the joint with a dancer's pad will be great for some shoes. Other shoes the orthotics will probably place too much pressure on the big toe by crowding the shoe or shifting your weight forward. It is wonderful to have a good pair of orthotics that support the arch and shift the weight to the center of the foot. Consider going up one half shoe size with orthotics. Look into getting carbon plates for some shoes. Also, look into rocker shoes like the New Balance 928 or Mizuno Wave Nirvana. Thank you so much for your blog. I wish I had found this years ago before all the damage had been done. I'm about ready to get the old boot and immobilize my foot. My husband thinks I should get a cortizone shot, but I am hesitant to get hooked on those. I appreciate any help you can give. Thank you again!